'OUR VOICI" mi "FEDERATION REPOtTM"
onse to the threat of terrorism. would be 70 years old Aug. 4.
and despicable act of violance,"
incident in Paris in recent days." victims of the war, under Mr.
way in California on August 2. Sept. 15 at Temple Israel. as Criminal Justice and Judaism. as we know how to make it. United Way works so well. to Vienna. Rumania, and Israel. 1976. And. in July 1976, 1977.
tion leaders departed Aug. 1.
tries, Canada and South Africa. rael, we have every reason to be-. lieve that challenges will be met"
surate with background and experience. 822-2120.
ores our faith in humanity. ore about this interesting story. I Prisons and labor camps. Board to go to Budapest. criminals. There is hope with th>. with incomes of over $25,000"
during the year of the award. Palm Beach County, will be the subject of "Camera 12,"
Channel 12 (WPEC), Sunday, Aug. 29at 10a.m. Warburton of the Community Action Council. Norman j Schimaiman Submit malarial lor puoimtion to Room Tanakoaa. Oiractoi o' PuD"
derstanding between the two communities." munity should anxiously await its studies. decided to emigrate to Israel. sional activities is taking place. our scientific works to nU? example of how fume ,"
August 28th at 9:15 A.M. I ul fraud upon the public. Open for them the pages of JEWISH HISTORY. Explore with them the beauties of TOAAH. Celebrate with them the wonders of HEBREW. 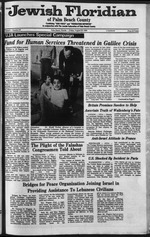 the PLO is to destroy Israel? one to whom attempts to sup? of administrative bans are alien. to the land of our forefathers. haps peace may come at last. Selma Rind to place your order. Palm Beach st 12 odon. and see the show "Chicago." tree planted in their honor. has pledged another 10,000 trees. ter of tourism; Harold Kichman. tels. Israel: and Jacob Barmore. Oct. 21 Paid up membership'. 3 Full Courts Ma* (k*. If You Do Not Belong To A Synagogue. vival of the Jewish people. to attending the "Open House"
giving dinner at the Holiday Inn*. be music, dancing and singing. at the home of Martha Sapir. 12 Days 11 Nights (Sept. 17-28) t~. *300 ^am. reserve marinade. Preheat broiler lor 10 minutes. side, basting every-5 minutes. Serves four. TUke it easy, lake a Costa." on any of these programs. YOUR BEST DECISION IN ULTRA LOW TAR. about the exciting Fall activities. again on Wednesday at 4 p.m.
El of Palm Beach. 832-0804. Beth Zion in Royal Palm Beach. All rates are pp/dfel occ. Toys 4 Us A Creative Circle. Toys 4 Us Creative Circle. 9.77OO to reserve a place.
' Nov. 7 through Nov. 28.
day, Nov. 14 to Thursday, Nov.
Tour cost per person: mem? For directions see Aug. 4.
at FAU are eligible to apply. NcwYxj Can Dial aTMinute Overseas Call. meet the total costs of tuition. sist those families in dire need. .unber cf sales will reach 500. And For All The World"
A ygar of Blessings ano pRospcRity. A yean of salvation and comfoot. a yean of joy and peace. With Us In Prayer And Song. SABBATH SERVICES: FRIDAYS 8:00 P.M.
good from 4.30 to 7 p.m. every day of the week! Royal Palm Theatre on Sept. 1.
p.m Daily services 8:15 am. and 6:30 p.m.
and 5 p.m. Saturdays and Holidays 9 am. 8421. Rabbi Howard Shapiro, Dr. Irving B. Cohen"
jamin Rosayn. Sabbath services, Friday at 8:15 pm. ing at 9:30 am. Daily Minyan at 8:15 am., Sunday and! Emanuel Eisenberg, Cantor Jacob Ehnan. Services Monday*"
Rackoff. Sabbath services, Friday at 8pm., Saturday 10"). 3536. Rabbi Bernard Silver. Cantor Seymour Zisook Saw"
8:45 am. Daily Minyan at 8:45 a.m. and 5 p.m.
traction committee chairman; and Donald Singer, architect. Sarvtna cnapali throughout tht U.S. and Canada and all South Florid* Camataran. Chap.lt in Sunriaa. North Miami Baach, OaaitiaaJ Baach and Margate. Menorafc Chapelt Cemetet v Counsel ir>q Service is available at no charge. to serve families in Florida." the spiritual leader and Earl J.
MAURICE R. PER ESS, M.D. Thm touMBt in tarqfaU knuUU. SOn PACK 100s FILTER. MENTHOL: 2 mg. "tar". 0.2 mg. n,cone per cigarette by FTC method.